If you are going to write a reflection on your international elective, here’s my advice. Hi there. My name is Allan Kember. Welcome. I am a fourth- and final-year medical student at Dalhousie Medical School and an incoming resident in the Department of Obstetrics and Gynecology at the University of Toronto. I recently completed a five-week clinical rotation in the Obstetrics and Gynaecology Department at the Korle Bu Teaching Hospital (KBTH) in Accra, Ghana. While I do enjoy writing, it requires time and effort – the former of which I lack. So I don’t tend to write unless I really need to. But after being approached by over two-dozen employees at KBTH about a foreign student’s recent reflection on KBTH, I feel that the time has come that I need to write something. The reflection was ignorant, insensitive, and insulting when read from the Ghanaian perspective. I can only hope that the reflection was in innocence and not malevolence, but regardless of the intent, damage was done. I have been in touch with the student’s school – a leader in the arena of global health – and have learned that an apology has been made and the situation has been sorted out. The reflection went viral after my first week at KBTH. Almost overnight, I felt that the relationships I had built in my first week had suddenly changed. They became subtly guarded. When I introduced myself to staff I hadn’t met yet, they weren’t as enthusiastic about meeting this foreigner. I knew something had changed for the worse, but I didn’t know why. It wasn’t until I was starting a duty shift one night when I learned why. I had just greeted a nurse whom I knew well when, suddenly, a serious expression came over her face. “Are you going to write something bad about us?” She proceeded to tell me about the reflection, which I later found and read. This wasn’t the only time I was asked this question over the next four weeks. In my discussions with KBTH staff, I learned that many of them were deeply hurt by some of the statements in the reflection. My heart sank every time I was asked this question, but each time, it gave me an opportunity to allay any concerns and, thus, build stronger and deeper relationships with the KBTH staff, which is good, because one day I hope to visit them again. Always remember your role. You are not a doctor (unless you are a resident) – you are not there to “work” or “practice medicine”. You are not a news reporter – you are not there to write a thrilling story or earth-shattering exposé. You are not an auditor for the WHO or FDA – you are not there to assess safety or the standard of care. You are not a professor – you are not there to instruct the medical faculty how to do things better. You are not an explorer – you are not there for an adventure. No, you are a medical student – you are there to learn. Don’t forget that. Even if you are a medical resident, you are not likely there to “work” unless you are legally permitted to do so by the laws of the country you are visiting and have extended your liability coverage from home (e.g., CMPA). Consider your choice of words carefully – it should reflect your role. If you were there as a learner, do not say, “I was working at KBTH.” Do not say, “I practiced medicine outside my home school and country for the first time.” Rather, you might say, “I was continuing my medical studies at.” Or you might say, “I completed a four-week elective clinical rotation at KBTH.” You weren’t “working”. You weren’t “practicing”. You are not a doctor (unless you are a resident or, in a unique situation, not a resident but holding an MD), and you do not hold a license to practice medicine in the country you were visiting. In fact, if you are a student, you do not even hold a license to practice medicine in your own country. Note, however, that if you were conducting research, that is different, and you may have been “working”. In remembering your role, it might be helpful to explain where you are in your medical studies in your introduction. Be cognizant that the medical education system in the country you visited may be very different than it is in yours. Medical school in Ghana is six years, so most Ghanaian readers would assume that a fifth- or sixth-year American or Canadian medical student is a senior whereas a third- or fourth-year student is a junior. However, it is important to note that medical school is only four years in the US and Canada, so a fourth-year student is a senior. This can muddy the waters, so it is important to give some context of where you are in your studies at home. This applies to residents too, for example, a residency in obstetrics and gynecology is five years in Canada and three years in Ghana; however, when the differences in programs are taken into account, it takes 13 years of post-secondary education in Canada to become an OB/GYN whereas it takes 14 years in Ghana. If your intention is to make your reflection public (e.g., a blog post), do not publish it until you have had it reviewed and approved by several individuals. First, you should have it reviewed by an individual with training and experience in cultural humility – the global health office at your school is a good place to look for such an individual. Second, have it reviewed by your supervisor at the site where you completed your elective. Third, I contend that you should also have it reviewed by your supervisor’s supervisor, i.e., the department head. Do not publish your reflection until you have the approval of these three individuals at a minimum. If these three individuals have approved your reflection, there is a high likelihood that your reflection will sit well with the majority. Note that this piece has been reviewed and approved by the above individuals (and more), so it is feasible. The reflection is about your experience. However, you need to also reflect on the language and sentiments you use to write about your experience. While it may be semantics, I avoid using “low-resource setting”. While “low-income country” appears to be the chosen language of The World Bank, it does make me a bit uncomfortable to use it in a public setting and especially when conversing with my colleagues from abroad. Albeit, I am happy that we have moved away from terms such as “undeveloped”, “under-developed”, “developing”, and “third-world”. “Low-resource” is a bit condescending. I use “limited-resource.” The beauty of “limited-resource” is that it applies to every hospital in every country, hence the existence of the principle of justice (fair distribution of scarce health resources) in medical ethics. You can say that KBTH is a “limited-resource” setting, and you can say the same about the Mayo Clinic. One is more limited than the other, but that doesn’t change the fact that both have their limitations. Do not label your elective site as “the most difficult of situations” and then proceed to tell your readers that if you could love your specialty in that situation, you could finally confirm that it is the right specialty for you. Not only is this incorrect (believe me, KBTH is not “the most difficult of situations”, and it is extremely unlikely that your school’s global health office will allow you travel to a country where such conditions exist), it is a blatant insult to all the staff at your elective site who happen to regard it as their place of employment – some for years, some for decades. Having sweat become an inescapable part of your life for a few weeks while on an elective in the tropics does not make it the most difficult of situations. Please! Although your international elective may be a grand adventure in your mind, this really isn’t the most professional way to express or approach your international elective or medical education. An adventure is “an unusual and exciting, typically hazardous, experience or activity.” If you use this word, what are you implying about your elective site? Be especially careful of the danger of a single story. It will be a great benefit to you if you watch the TED Talk called “The Danger of a Single Story” by Chimamanda Adichie. Remember that your reflection is painting a picture in the minds of your readers. If all they can imagine of Ghana is a scene of people wearing tattered rags for clothing amongst dilapidated and abandoned buildings, then you’ve told a single story and have led your readers astray. Far astray in fact. Over the past three years, I have spent more than two months living in Ghana, and most of the time, I feel underdressed. As a whole, Ghanaians are extremely well dressed – I contend, more well than my own culture. Think about your privilege. Do not be ignorant of it. When you are ignorant of your privilege, you become entitled. The decor of pleasant words, no matter how generously applied, will fail to hide the reprehensible backdrop of entitlement from the minds of your readers. Do not major on the negatives. Walking the tenuous line between accuracy and cultural sensitivity is likely the most difficult part of writing a reflection. Negatives can be found wherever one goes in the field of medicine – no matter the country or setting. The concept of relative disparity is helpful in understanding the ubiquitous nature of this phenomenon. Here is an example of majoring on the negative: the fact that patients’ families visit them at KBTH and stay nearby could be attributed to something negative by saying, for example, that family needs to be nearby in case the patient needs medication because they must pay for it out of pocket. But think about that for a second. If you were unwell and in the hospital, would you want your family nearby? Do patients’ families in Canada or the USA visit them while in hospital, bring them things, and help address any need they might have? Of course! There is a reason we call them “loved ones”. So there is no need to paint this fact in a negative hue. Further, virtually anywhere you go in the world (not just KBTH) you will learn that family is an integral part of patient care and that outcomes tend to be worse when family is not involved. A specific example from pediatrics includes “care-by-parent units”, which were invented in Canada by the internationally known and respected pediatrician, Dr. Richard Goldbloom. Avoid making comparisons between the healthcare system at your elective site, with all its gaps, faults, disparities, and tragedies, with your flawless healthcare system at home (I am being sarcastic – while some are better than others, no healthcare system is perfect and all of them have their flaws). It is very tempting to make the “copy-and-paste” error, that is, copying what seems to work in a Western context and attempting to paste it somewhere else (e.g., West Africa) even if it isn’t feasible, applicable, culturally-sensitive, or sustainable. If you are going to make comparisons, you better invest a lot of time to do a lot of research to make sure they are fair comparisons. Obviously, there will be differences between healthcare systems in high-income, middle-income, and low-income countries. The reasons for these differences are extensive and incredibly complex – only a handful of intellectuals in the world can explain them adequately, so I advise to stay away from comparisons unless you have truly done your homework. Why not leave such analyses to organizations like The World Health Organization? Ultrasound, imaging, and continuous fetal monitoring are available at KBTH and in Ghana – I saw all three used multiple times during my elective at KBTH. Privacy is not a “luxury” at KBTH. This is why they have curtains and privacy screens available for use in every encounter. I set up the privacy screens and pulled the curtains dozens of times each day. Implying that something we take for granted in Canada and the USA is a “luxury” at KBTH contributes to driving a false wedge of disparity deeper and deeper into the minds of your readers who don’t know better (unless they are Ghanaian are are intricately aware of the situation on the ground there). The blood bank is not notoriously empty at KBTH. Stating that the blood bank is notoriously empty may capture the interest of readers, but it is simply not true. After many duty shifts, unused blood is actually returned to the blood bank by the senior resident; however, in saying this, I wouldn’t want to detract from the age-old need for blood donors. While I was at KBTH, I saw a presentation by a senior consultant regarding the blood donation issue, and one new change that was implemented while I was at KBTH was that the blood bank began offering a blood donation site at the antenatal care outpatient department in order to streamline blood donation from patients’ family members. IMPORTANT: A reflection is not the place to give a case-report. If you were to approach a major journal, for example, the BMJ, with a case-report, you would be absolutely refused publication if you did not have written informed consent from the patient. This refusal would be regardless of how well you anonymized the details of case. It is unethical to publish a case-report in a medical journal without written, informed consent of the patient, so why would it be any less unethical to do so in your international elective reflection? Be very careful with sensitive issues. One such issue you will encounter is religion. I can almost guarantee you that religion and faith play a much greater role in the society at your elective site than it does in your home country. If you are not a person of faith, you likely have no idea how it feels to have the most precious thing you hold constantly belittled, trivialized, and demeaned by society around you. So when you dismiss the patient and her family’s faith and prayers as mere futility in order to make room for your all-knowing savior-doctor complex, you’re trampling underfoot not only this patient, but the majority of the population of Ghana. You are also forsaking your duty per the CMA Code of Ethics, Fundamental Responsibility #3: “Provide for appropriate care for your patient, even when cure is no longer possible, including physical comfort and spiritual and psychosocial support.” If you knew anything about the faith that your patient and her family holds so dear, you wouldn’t dismiss their acceptance of her prognosis as “odd”. Further, you wouldn’t conclude that their understanding of death and dying are a result of the poverty that is a way of life in Ghana. Ouch! That’s an utterly ridiculous conclusion! It implies that poverty takes the sting out of death. When the child of an impoverished mother and father dies, do you think they don’t grieve because they are poor, or in other words, because the value of their child’s life was somehow inferior to that of a middle- or upper-class child? Poor people grieve too. Dr. Paul Farmer once aptly stated, “The idea that some lives matter less is the root of all that is wrong with the world.” Poor lives matter, so don’t say that poverty makes suffering and death easier. Maybe take a look at Gutierrez on liberation theology and the preferential option for the poor. If you happened to ask this patient about her faith, perhaps you would learn that her acceptance of her prognosis may not be so odd after all. Moving on now. You can’t speak the local language and you’ve had relatively little exposure to their culture, so don’t presume that you are in a position to evaluate patient-doctor communication. Likewise, you are not in a position to evaluate the residents ‘and staff’s decision making. Stating that physicians at KBTH order the one test they think is the most important and then hope for the best is incredulous. First, it assumes that all patients presenting to KBTH can only afford one test – not true. Second, it implies that physicians at KBTH have tossed evidence-based medicine to the wind in favor of shooting from the hip – also not true. In fact, far from the truth. The consultants at KBTH happen to be board-certified by the West African College of Surgeons (at least 14 years of post-secondary education and training), so I’m not sure what gives a student the credentials to go about casting doubt on their clinical judgment. Further, don’t sensationalize the physical exam as if it is the only tool that doctors at your elective site have at their disposal. With the modernization of medicine, we are, both literally and symbolically, losing touch with our patients. In the dawn of artificial intelligence, perhaps watching the TED talk called, “A Doctor’s Touch” by Dr. Abraham Verghese would be helpful for any medical student who doubts the importance of the physical exam in his or her own practice. Thanks for reading. Happy reflecting! From October 16th through 27th 2017, I had the immense privilege of completing an observership within the Cardiac Critical Care Unit (CCCU) at the Hospital for Sick Children (SickKids) in Toronto, Canada. I must admit that the CCCU was overwhelming in many aspects. Overwhelmingly complex, yet overwhelmingly specialized. Overwhelmingly busy, yet overwhelmingly efficient. Just imagine placing a four-year old into the cockpit of a Boeing 787 Dreamliner and telling him to, “Go for it. Take off, and deliver us to our destination safely.” I’m the four-year-old. The CCCU is the Boeing. Need I say more? Established in 2006, the Division was the first of its kind in Canada. It has about a half dozen staff physicians, dedicated nursing and interprofessional staff, about a dozen fellows, and a 23 bed critical care unit. While rounding with the fellows and staff physicians, I saw and was taught about children with the most complex medical pathology in the country and witnessed the administration of commensurately advanced and ground-breaking treatments; however, although this would be an incredibly fascinating topic, it will not be the topic of my reflection here. Rather, I would like to reflect on the primary objective of my visit to SickKids: to interpose myself at the interface where critical care medicine meets data science and, thereby, learn about the application of data science in medicine. While I am a far cry from an expert in either field, I will attempt to share a few thoughts I have had over these two weeks including why big data in medicine interests me, why it should interest the medical community, and my perspective of the data science program at the SickKids CCCU. My professional background is in mechanical engineering, and I’m currently completing my fourth year of medical school. Risking over-generalization, I will admit that my experiences in the classroom and clinic during medical school have taught me that the practice of medicine is more of an art than a science. As a trainee, I have not found peace with this notion but derive comfort in that, given time and practice, I will become a better artist. For the time being, I prefer the scientific approach to clinical problems, an approach inculcated during my training and practice as an engineer, an approach that is broad and multifaceted, team-oriented, step-wise, calculated, and endears a clear understanding of the background, problem definition, specifications, and real-world constraints. The scientific approach may not be time efficient but is incumbent upon trainees because they lack the knowledge and experience to approach medicine otherwise. I was introduced to helpful ideas related to this dilemma early in my medical training by two faculty members in particular. First, Dr. David Haase, an infectious disease physician, taught me about the maturational pathway of trainees, which could be applied to any field of practice: we all begin as unconsciously incompetent and, with training, progress to become consciously incompetent, then unconsciously competent, and, finally, consciously competent. A trainee in the incompetent stages attempting to practice medicine as an art would be nothing short of guess work; trainees must take the scientific approach. As competence is gained over years of study and practice, the trainee matures, and the transition from the scientific to artistic approach becomes possible while maintaining a good outcome. Second, under the tutelage of Dr. Pat Croskerry, a global pundit in critical thinking in medicine and the Director of the Critical Thinking Program at Dalhousie Medical school, I have come to appreciate the subject of metacognition, that is, thinking about how we think – remember, I am an engineer with no formal psychology background, so Dr. Croskerry’s lectures seemed quite novel to me. The two most important physician behaviors are knowledge and decision making, yet our decision making ability in medicine is unacceptably poor relative to other high-stakes fields, e.g., aerospace engineering. The diagnostic failure rate in medicine is approximately 15% and, accordingly, diagnostic error is by far the leading cause of medical harm resulting in legal action. Recognizing that at a fundamental level, how we think determines how we make decisions, Dr. Croskerry taught us about dual process theory, which I found quite helpful. Basically, when we think and make decisions, we operate between two systems: the intuitive (system 1) and the rational (system 2). System 1 is fast, informal, subjective, context-dependent, qualitative, and flexible. System 2 is slow, formal, objective, context-dependent, quantitative, and rigorous. As humans, we spend more than 95% of our time in system 1, which is where most heuristics, biases, and errors occur. The human mind is a cognitive miser, which refers to our tendency to take the path of least resistance in our approach to problem solving. The remarkable efficiency of system 1 enables this and saves many lives; however, it is a double-edged sword because system 1 plays a major role in medical error, which is the cause of a significant proportion of deaths, for example, 9.5% and 3rd highest cause of all deaths in the US according to a study from Johns Hopkins published in the BMJ in 2016. Trainees begin by functioning mainly in system 2 (rational) and eventually progress to system 1 (intuitive) as functions are repeated time and time again and pattern recognition develops. The systems can override each other, and we can toggle between systems in our decision making process, e.g., critically reviewing the history, physical, lab, and imaging data to “double check” my gut feeling that the diagnosis is pneumonia (system 2 overriding system 1), versus following my gut feeling and choosing to empirically treat this patient for pneumonia now because the context is so dire such that I cannot wait any longer to make a fully informed decision (system 1 overriding system 2). In either system, decision making can be compromised by fatigue, sleep deprivation, and cognitive overload. I liken system 1 thinking to the artistic approach and system 2 thinking to the scientific approach. Ideally, all our decisions would be made in system 2 and, being the best decisions, would yield the best results; however, there are at least two problems with this. First, system 2 thinking is time consuming, which makes it impossible for the human brain, operating solely in system 2 and under extreme time constraints, to make the best decisions rapidly. Second, system 2 thinking is cognitively demanding, and this demand is amplified to exponential proportions as more variables are added to the problem (Hick’s Law postulates that time on a task is positively correlated with the number and complexity of choices), which makes it impossible for the brain to arrive at the best decision every time with an error rate of zero. Also, like the relationship between distance, velocity, and time, the time and cognitive requirements of system 2 thinking on the brain are not independent: increasingly complex problems (distance) demand increased cognitive effort, which, due to a limited cognitive processing speed so intrinsic to being human (velocity), forces a slower arrival at a decision (time). By extension, we can appreciate that system 2 thinking is less suited for high-acuity, time-sensitive, data-intense situations commonly encountered in critical care or emergency medicine, for example. Fortunately, system 1 thinking, with its best-selling feature of pattern recognition, allows us to overcome these two major supply-demand problems (time, cognition) and performs quite well most of the time. So why the discussion about how we think and make decisions? Let me bring this back to why data science in medicine has piqued my interest. Given that we want to always make the best decisions all the time, let us assume that we can only think in system 2 – our decision making process would be formal and objective, but despite always making the best decisions, the time taken to reach our decision could be hours, days, months, or even years depending on the cognitive demand of the clinical problem. What if we could compress this computational time so that it was less than a second? Not only would it be fast, it would be faster than system 1 thinking. This is precisely where data science comes in, and this fascinates me. With data science techniques, we can collect, process, and store huge amounts of physiologic data from our patients, including “real-time” variables and wave forms (e.g., heart rate and variability, respiratory rate, central venous pressure, systolic and diastolic blood pressure), lab values (e.g., hemoglobin, arterial blood gases, lactate, SvO2), and treatment parameters (e.g., ventilator settings, medication infusion rates). We can then use data science to develop patient risk analytics engines on this dataset, and these engines can then be used to collect, process, and analyze data simultaneously and enable healthcare providers to make the best decisions at the bedside. One such example is the inadequate oxygen delivery (IDO2) index by Etiometry, Inc. (Boston, USA), which received U.S. Food & Drug (FDA) 510(k) clearance in 2016. Using a software model of human physiology, the IDO2 integrates 18 measurements of 9 physiologic variables and Bayesian inference to continuously adjust the risk of inadequate oxygen delivery based on current and previously acquired data. The IDO2 index enables healthcare providers to rapidly, effortlessly, and accurately assess the likelihood that the patient is experiencing inadequate oxygen delivery defined as a mixed venous oxygen saturation (SvO2) less than 40% – intervention may then immediately ensue to prevent morbidity and mortality. By the way, critical care units are “oxygen-delivery-centric” – everything evolves around oxygen delivery. The IDO2 index was made possible by applying data science techniques to a huge data set – nearly 2,300 patients and over 10,000 measurements of venous blood gases – to develop the original analytical engine. The engine is now packaged with Etiometry’s FDA-approved software, T3 Data Aggregation & Visualization, which allows healthcare providers to collect, store, and visualize ICU data in essentially real-time at the bedside. To think through such computations in system 2 thinking would take hours, days, months, or even years, so I have likened data science to a time warp. But it’s not like any time warp. This time warp is bipolar. By bipolar, I mean that it can be viewed as both a time dilation (slowing down of time) and a time contraction (speeding up of time) at the same time. As a time dilation, under the pressure of needing to make the best decision within a matter of seconds, big data allows us to consider the whole picture as if everything were in slow motion and we were thinking in system 2. As a time contraction, big data harnesses super-computing power to transform an analysis that would take us years to compute in system 2 into a matter of milliseconds, allowing us to make the best and maximally informed decision, now. Now, that is cool, but data science has much more to offer. Thus far, I have only discussed decision making as a response – a reactive process. What if, in medical decision making in the acute setting, we were able to transition from being passive and reactive (the traditional approach in the acute setting), to being predictive and active? What if, instead of letting things happen to us, we happened to things? For example, what if we were able to predict that our patient would have a cardiac arrest within minutes and, instead of the arrest happening to the patient, we happen to act within seconds to change the clinical course of the patient and prevent the arrest? Spoiler alert: we already can, kind of. Kennedy et al., (Houston, USA) are using time series trend analysis enabled by support vector machine algorithms to encode physiologic deterioration – a time dependent process – in PICU patients and thereby predict and prevent cardiac arrest (Pediatr Crit Care Med 2015;16:e332-e339). The data team here in the CCCU at SickKids is also using data science to build models that predict cardiac arrest. Now, that is super cool, and this sort of potential inherent in data science is expressly why the medical community, at large, should “listen up”. It caught my ear in 2015 when Dr. Peter Laussen, Chief of the Department of Critical Care Medicine at SickKids, gave a grand rounds talk on data science in the pediatric CCCU at the IWK Health Centre in Halifax. After his talk, I stayed to chat with him about a similar vision that I had in the context of my global health work, and he graciously invited me to complete an elective rotation in data science at the SickKids CCCU. Now, I’ll share a bit about what I learned about the data science program within the CCCU. I learned that thus far, data science is a very small component of the CCCU but, despite its small size, it is quite complex, increasing in magnitude, and gaining clinical relevance with time. Over a few years, the data science team has grown from one person with an idea to a multidisciplinary team of at least seven individuals from varied clinical, professional, and research backgrounds. The program is supported by only one full-time software engineer and three part-time data scientists, which was surprising to me. How does the data flow from being a signal recorded by a device attached to or embedded in the patient to a data point in storage? From bedside to byte stored? In brief, the physiologic data collection devices (e.g., arterial lines, CVP line, BP cuffs, SpO2 probes, near infrared spectroscopy, respiratory flow transducers, thermometers) and the ventilator settings (e.g., PEEP, vent rate, Ppeak, TV, etCO2) are connected to a bridge that interfaces with a Philips IntelliVue bedside monitor. To date, aggregate infusion pump data inaccessible for proprietary reasons imposed by the vendor. The data displayed on the IntelliVue monitor is sent to the Philips central server via Ethernet, which then sends data to three places: a central monitor at the nursing station for monitoring in real-time by nursing staff not at the bedside, the electronic medical record (EMR) for charting of patient vital signs at regular intervals, and to the T3 (tracking, trajectory, and trigger) system allowing visualization of the patient’s current status and past course and the IDO2 by any healthcare provider at any computer with SickKids intranet connectivity and a secure hospital login. The data team also siphons all the data from the IntelliVue monitor via serial connection to a middleware medical device integration service called ViNESTM by True Process, which acts as a device gateway, streamlining the high frequency (500Hz) waveform, derived value, and device parameter data for intelligent and queryable storage before it is sent to the CCCU database. An additional source of data feeding into the CCCU database is the EMR, which ultimately links time-stamped laboratory values (e.g., arterial blood gases, lactate, hemoglobin) with the physiologic and device settings data. The EMR also feeds into T3 in the same manner, allowing for continuous visualization of trends and current time-synced physiologic monitor data, lab data, and device settings anywhere the user logs in. Very impressive. I learned of a few barriers that the data science team has encountered in their journey thus far. From a human factors engineering standpoint, I’m told that something seemingly as easy as convincing CCCU staff (nurses and respiratory therapists) to connect the ventilator to the Philips bridge via an Ethernet cable when ventilation was initiated was much easier said than done. Eventually, the team achieved buy in, and this critical step is now routine practice in the CCCU. Lin et al., (BMC Medical Informatics and Decision Making (2017) 17:122) recently published a human factors study evaluating T3 in the SickKids CCCU to identify interface usability issues, to measure ease of use, and to describe interface features that may enable or hinder clinical tasks. The finding that I found most interesting by Lin et al., was clinicians’ mistrust in the IDO2 due to “lack of transparency and published evidence” – only one of seven clinicians in the study were familiar with what the IDO2 even was, which indicates that perhaps ignorance and lack of knowledge was more cause for distrust than the cited reasons. From the hospital systems management, ethical, and medicolegal perspectives, another barrier the team has faced includes the issue of prospectively collecting identifiable patient data, without consent from the patient or his/her substitute decision maker, for various clinical, research, quality assurance, and quality improvement purposes. What are the managerial, ethical, and legal implications of a data program and how can these be adequately addressed? Who knows at this point, but what I do know is that it is imperative for a budding data team to have an advocate with influence at the level of hospital management to help overcome these barriers. I am not privy to the expenses associated with initiating and supporting the data science program, but I do know that the program runs on a very small budget, yet another barrier. One would think that a program with such unprecedented potential at a leading pediatric hospital would be well funded; however, remember that we are at the dawn of the interface between medicine and data science. Data science and medicine are two soon-to-be lovers that have only begun to embrace – the potential of what their relationship could produce remains yet unrealized. Like an overeager but well-meaning parent, the data science team has accompanied these two on their first date here in the CCCU. Medicine is responsible for paying the bill but is broke tonight for obvious reasons. The parents will have to float the cost for now, but it’s an expensive evening out and funds are tight at home. Enough analogies. Although budget limitations can slow progress, it can make things more efficient, which is exactly what is happening at SickKids. I happened to be at the CCCU during a special time for the data science team. On October 19th, 2017, the team collected, processed, and stored their trillionth data point. A trillion is a million millions! 1,000,000,000,000! How do we store this much data? How many bytes would it occupy? How much would it cost us to store this much data? I don’t know the answers to these questions, but what I do know is that the CCCU data is securely stored at the Centre for Computational Medicine (CCM) shared by SickKids and the University Health Network in Toronto. The CCM boasts a 268 computer node cluster network with 34 terabytes of RAM and is capable of providing performance of 80 Gb/s steady throughput from the computer nodes to a 2.4 petabyte (1 petabyte = 1,000,000 gigabytes) storage cluster. Woah! The SickKids CCCU data team has access to the CCM, which allows for “distributive computing” – the computer-world parallel to “teamwork”, fitly expressed by the old adage, “many hands make light work”. Distributive computing is necessary given that data science operations on such colossal datasets require an enormous volume of computational power. Regarding the trillion data points – in its raw format, it would occupy a huge amount of memory (initial size: in the ballpark of 50 terabytes! ), which would be prohibitively expensive to securely store using commercially available data servers; however, using a technique called “lossless compression”, the data science team has invented a novel way to compress the data they collect at a 100 to 1 ratio for space-efficient, cost-efficient, and readily accessible storage (final size: a mere 400 gigabytes!). With lossless compression techniques, no information is lost during the compression and, therefore, all the original information is exactly the same upon decompression. Incredible! Collecting data for machine learning purposes is distinct from collecting it for research or QA/QI purposes. With machine learning in mind, we must be much more diligent to minimize errors and ensure data continuity. Data quality and fidelity are not a given, so ensuring data quality is a job in itself. Also, for predictive analytics, you need to link what you are measuring to what you are trying to predict, which requires a secondary data collection stream of outcomes, which introduces yet another source of error: human error, e.g., digit preference, transcription error, labelling error. Interestingly, humans are not the only ones guilty of digit preference – I learned that the measurement devices we use have digit preference too. We also need to be wary of systematic error introduced by a measurement device itself as this, by compromising data integrity and accuracy, could undermine every decision we make based on the data, whether clinical or research. One example is the arterial line blood pressure measurement, which is a second-order dynamic system possessing a natural frequency and damping coefficient influenced by multiple factors including the catheter, extension tubing, stopcocks, flush devices, transducer, amplifier, and recorder. Arterial line blood pressure measurement was first reported in the literature in 1949, and as the medical field adopted the technology over the subsequent decades, it was incumbent upon physicians to understand the physics underlying the technology and morphology of the blood pressure waveform it produced. However, in more recent years, having received little-to-no teaching on the underlying physics of waveform generation, students and staff healthcare providers pay little-to-no attention to the quality of the waveform and focus solely on the quantity (numbers) displayed next to the waveform, i.e., the systolic BP, diastolic BP, and mean arterial pressure (MAP). Relying on these values and ignoring the waveform morphology can lead to significant medical error. A “whip” waveform morphology indicates the system is under-damped and is overestimating the systolic BP and underestimating the diastolic BP. Conversely, when a clot forms in the catheter tip or air bubbles enter the extension tubing, the result is an over-damped system and can be recognized on the waveform by the loss of the dicrotic notch. My point is that although data science may perform system 2 thinking for us some day, this does not mean we can shut off our brains. Quite the contrary. We need to be more vigilant in understanding the tools we use. Data science is a powerful tool with unprecedented complexity, and, because inherent to its use are benefits and risks like any other medical treatment, it is critically important for healthcare providers that wield it to do so responsibly. This includes a good understanding of where, how, and how much error may be introduced and how this might affect outputs and thus our decisions – not an easy task in the face of an ever-widening chasm between two ever-specializing fields. Finally, I learned that the data science program is truly a team effort at its core. I was impressed by the diverse, but complimentary, range of professional backgrounds that constitute the data science team. Drawing from various fields unrelated to healthcare, the team has made the data science program what it is today and has poised it well to have tremendous impact in the near future. On reflection, this diversity makes sense to me and is a necessity for the excursion the team is taking into uncharted territory. Mark my words, the SickKids CCCU data team is a team to watch. In closing, I would like to extend a heartfelt thanks to Dr. Laussen, the data science team, and the Division of Critical Care for their warm hospitality over the past two weeks. This is a report of my experience at Unite for Sight’s 14th annual Global Health and Innovation Conference held at Yale University on April 22 and 23, 2017. First, I will start off with my presentation of my Dalhousie Research in Medicine project, the Ghana PrenaBelt Trial. I presented my work on Saturday to a multidisciplinary, international audience of about 100 during the “Maternal, Child, and Family Health: Presentations by Student and Young Leaders in Global Health”. My co-presenters included four other medical students from Canada, the US, and Nigeria. My take-home points were that the PrenaBelt, when used during sleep throughout the third trimester, led to an increase in birth weight by about 100 grams when compared to a sham device, but this was not statistically significant. Also, informal education about back sleep in pregnancy by midwives combined with an intervention to prevent back sleep (whether the PrenaBelt or sham-PrenaBelt), led to a statistically significant increase in birth weight (by 107-153 grams), greater gestational age at delivery (by 6 days), and a lower rate of preterm delivery (4X less likely) than a non-interventional, non-back-sleep-educated control group. My presentation was well received. However, it was not until the “Innovation & Ideas Evening Networking Reception” later, that I received some very positive and encouraging feedback from four Indian neonatologists. They had missed my talk (due to many co-occurring sessions), but were asking about my work. I had my presentation on my iPad and gave them a brief version of my talk, engaging them in discussion at the same time. They were especially intrigued about my secondary outcomes, which I had glossed over pretty quickly during my talk earlier that day, namely, the gestational age at delivery and preterm delivery rate differences between the interventional and non-interventional groups. As a result of this conversation, I will be taking a closer look at these results. Multivariate logistic regression is also underway. Regarding the presentations, here are a few remarks that were memorable. During her keynote, Vanessa Kerry, mentioned the moral dilemma of how 80% of journal publications on HIV research in Africa have a Western investigator as the lead author. In academia, our personal and professional promotion are contingent, at least in part, to being the lead author (on as many papers as possible); however, we must be careful not to exploit our collaborators for our own interests, without whom we could do nothing. The locus of control must be theirs. They must have and feel the ownership of the work. All of this is making me re-think the authorship order that I had in mind for my team’s work in Ghana. The most innovative idea I saw at GHIC was NeMo (“Neonatal Monitoring”), which is a simple device that empowers mothers to identify neonatal danger signs within the first week of life to prevent neonatal mortality. NeMo was designed by Rachel An and her team at Johns Hopkins University. It involves educating the mother of 4 warning signs and also a sensor on the neonate that continuously records the respiration rate and temperature, which is transferred to an app on mom’s phone and sounds an alarm if these parameters meet a set threshold. I think it has great potential due to its simplistic nature and low cost (50 cents). Twice at GHIC, I heard presenters (one a keynote, and one a medical resident) say that if medical trainees (whether students or residents) think they can justify participation in “international work” or “global health”, they are only deceiving themselves and causing more harm than good and that this is an immoral practice that must be stopped. I have heard this sentiment before in a variety of settings. I have a problem with it because it uses such a wide brush to paint ALL medical trainees involved in global health as medical voluntourists attempting to build their CVs and egos at the expense of the world’s poor, which is not true. Had these presenters attended the “Student and Young Leaders in Global Health” sessions they would have learned that none of the presenters were actually involved in clinical work abroad. On the contrary, almost every presenter was involved in a supervised, productive, enduring, North-South, research collaboration assisting LMIC clinicians and health care workers answer their locally-generated research questions. The presenters had written and won grants to support the research of their LMIC partners, personally assumed the expenses to travel to the countries of their partners, and invested their own time and research expertise on assisting with data analyses and publication. There is a world of difference between trainees involved in global health research collaborations (helping the locals) versus global health clinical electives (potentially harming the locals). Saying that all medical trainees participating in global health work are “deceiving themselves” and “causing more harm than good” is an ignorant generalization and a slap in the face to many, like myself and my co-presenters at GHIC, who sacrifice more than ever gets told or recognized on behalf of our LMIC partners and the population they serve. I assure you that our LMIC partners would agree and be the first to stand in our defense. For trainees who are considering the contentious practice of global health electives and medical voluntourism, Jane Aronson put it well at GHIC: “You have a moral duty to volunteer, BUT you have a greater moral duty to be a trained volunteer.” End of rant. The most important take-home message from the conference for me personally was said by Jordan Levy of Ubuntu, “You cannot create deep impact without first taking care of yourself… you bear the immense weight of responsibility in social change… You are the engine behind social change – take care of that engine.” This issue of self-care versus the personal sacrifice incumbent in global health work came up again in the “Leadership and Management Strategies Panel”. Richard Skolnik recounted how in his work at the World Bank, he has traveled 125 days of the year for 25 years, made 91 trips to India, been in several accidents and bombed, contracted hepatitis, almost died from a GI bleed, and so on. He emphasized that we often view global health heroes as if their lives are perfect but that a tremendous amount of hardship will remain forever untold. “Global health work”, he said, “is not healthy.” The take-away is that “job one” is to take care of one’s self. Wise and timely advice. Point taken. The most touching account at GHIC was told by Chris Underhill at the “Integrity in Global Health and Innovation Plenary Panel”. Early on, the panelists made it clear that despite their being chosen as panelists on a session about integrity, they had by no means been perfect examples themselves. They were asked to elaborate. Chris proceeded to tell a story how early in his career, he was visiting a hospital in Haiti. He got lost in the hospital, and while wandering the halls, he encountered a cage in which five mentally ill men were locked. There was a group of boys torturing the men by poking sticks at them through the bars in the cage. Chris said, “At that stage of my life, I didn’t know what to do, so I did as told in the famous account many here will be familiar with – I ‘passed by on the other side’.” Of course, he was referring to the account of the Good Samaritan told by Jesus in Luke 10:25-37. Chris continued, “It was later that I grabbed mental health with two hands!” Integrity is doing the right thing regardless of who is watching. In closing, I would like to quote something Richard Skolnik said during the integrity panel that resonates with my own circumstances. A warning. “No NGO had failed because they focused their work. They failed because they violated Management 101 and tried to do too much too soon.” How true. It reminds me of something a mentor said to me a few months back, “Be careful about collaborating when you should be consolidating – especially if you have a limited capacity to manage.” Point taken again. I must say that GHIC 2017 was an tremendous opportunity to learn and network, and I hope to attend again at some point in the future. Special thanks to my team in Ghana, Canada, Australia, and USA. Special thanks to my funders, Grand Challenges Canada (which is funded by the Government of Canada) and the Dalhousie Medical Research Foundation. Finally, special thanks to the JJ Carroll Travel Fund for financial support of my trip to GHIC 2017. Dalhousie students collaborating with Dr. Jerry Coleman (Korle Bu Teaching Hospital, Accra, Ghana) at Just Us Cafe near Dalhousie Medical School. From left to right: Emily, Jon, Mike, Dr. Coleman, Allan, and Sarah. It has been over a year since I posted on here. Shame on me. A lot has happened. One reason that I haven’t posted anything here is that I had decided to focus more on the GIRHL website. I built a couple pages there and wrote a few blog posts. Here’s one of the pages: Meet the PrenaBelt Team! The other page I built was retired. Dr. Coleman came to Halifax for the month of May to train in fetal ultrasound at the Fetal Assessment Treatment Centre at the IWK Women’s Health Centre. He also presented the interim results of the Ghana PrenaBelt Trial at the 2016 Bethune Round Table in Halifax, NS. We completed the Ghana Prenabelt Trial in July. I worked on the analysis from July through September. We submitted our Final Report to the Ghana Food and Drugs Authority in September. We launched the KBTH-GIRHL Healthy Birth Weight Study in April, which is a cross-sectional study that will complement the results of the Ghana PrenaBelt Trial. This study is slated to be completed in January 2017. Dr. Warland and her team presented the Australia PrenaBelt Trial results at 4 international medical conferences. These results are very intriguing. Dr. Warland visited our team in Halifax in September to present her team’s research at a Grand Rounds at the IWK and brainstorm next steps. The Halifax PrenaBelt Trial launched in the spring of 2016 and is slated to be completed by January 2017. Interim results (October) were promising. All for now. Gotta run! Stay tuned in 2017 as we have several interesting conference presentations planned. We also plan to complete all the analyses and release/publish our results. Ghana PrenaBelt Trial – Recruitment 50% complete! My colleagues at the DalMed Global Health Interest Group have published the most recent update on the Ghana PrenaBelt Trial: Recruitment is 50% complete! Please click the hyperlink to read the update. Congrats to the Ghana PrenaBelt Team – Dr. Coleman, Josephine, Jemima, Rose, Joyce, and Max! Here is a link to a ~2 page article I wrote on “Why I want to fix obstetric fistula” for the DalMed Global Health Interest Group. Well, I didn’t write it for the DalMed GHI, but I published through them. I wrote it more for myself because sometimes it helps to write one’s thoughts down. I will check the link periodically to make sure it continues to work properly. If there are issues, I will just publish the post on this blog. Update: Recruitment for the Ghana PrenaBelt Trial is 25% Complete! Greetings! It is with great excitement that I write this update. Ever since my team secured authorization from the Ghana FDA on August 14th, 2015 to conduct our clinical trial in Ghana, things have been moving at a lightning pace. While I settled in to my second year of medical school back in Halifax, Dr. Jerry Coleman, our Principal Investigator at the Korle Bu Teaching Hospital, conducted some final meetings with his team in late August and early September. On September 7th, 2015, Dr. Coleman and his team successfully launched the Ghana PrenaBelt Trial – a double-blind, sham-controlled, randomized controlled trial investigating maternal back sleep in late pregnancy as a potential modifiable risk factor for stillbirth and low birth weight. Dr. Coleman’s clinical team – made up of four midwives – is working daily and diligently in the antenatal care clinic to invite, screen, consent, enroll, randomize, and interview participants. It is a colossal task, and they are doing an exemplary job! During the first week of the trial, the team recruited two participants per day on average. By the second week, the average was four participants per day. I am happy to announce that the team has reached our first milestone of 50 participants recruited! Given that our target sample size is 200 participants, recruitment is 25% complete. The participants are eager to use the PrenaBelt every night. Family are engaged too – several participants have reported that their husbands are encouraging and reminding them to wear the PrenaBelt every night! A special thanks to our midwives: Josephine Kwaw, Rose Quartey, Jemima Marfo, and Joyce Dodoo. Dr. Coleman and I have been having weekly meetings via Skype to debrief on progress and discuss any issues. He has expertly managed everything related to the trial and team to date – props to him! Maxfield Okere is our Data Lead in Ghana. Maxfield has been remarkably proficient in managing all the data related to the trial. The data team is completed by my Project Coordinator in Halifax, Jesse Wells (GIRHL), and our newest addition to the PrenaBelt team, Sarah MacRitchie (GIRHL). A hearty thanks to the data team! My co-investigator and mentor, Dr. Heather Scott (IWK Women’s Health Centre), visited the team at the trial site in Ghana from September 26th through the 30th, 2015. The visit was of mutual benefit. The team was thrilled with the opportunity to meet and get to know Dr. Scott, vice versa. Dr. Scott was able to see the recruitment process from start to finish and work along side the clinical team. Relationships between Ghana and Canada were strengthened and will hopefully continue to grow in weeks, months, and years to come. I am deeply indebted and grateful to Dr. Scott for her alacrity in setting aside the million other things she has going on and travelling almost 8,000 kilometers for this project! Finally, I am excited for my co-investigator, Dr. Ali Borazjani (GIRHL), as he prepares to visit the team at the trial site in late October through early November. Hopefully, I will have another update for you after Ali’s visit! This project is supported by Grand Challenges Canada, which is funded by the Government of Canada. 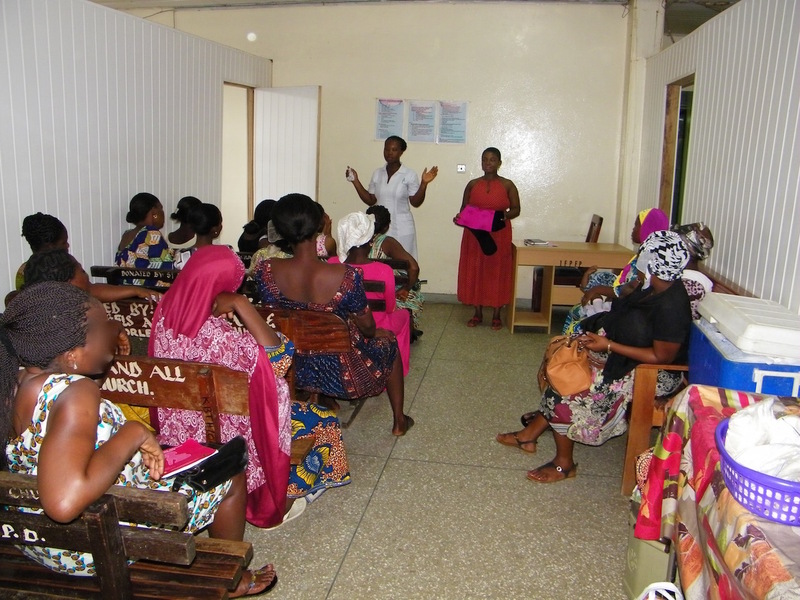 Midwives Jemima (left) and Josephine (right) delivering an introductory and instructional session to newly recruited participants.